ULTRA light Aluminum construction for 43% weight savings ULTRA shiny Tumble polished finish holds shine longer ULTRA strong Billet metering blocks & base plates ULTRA cool Red anodized billet aluminum metering blocks and base plate ULTRA easy Built in sight window for simple float adjustments ULTRA fast High-performance fuel curves Holley Double Pumper® carburetors are a perfect performance upgrade for hot street cars and race vehicles. Double Pumper carburetors are an American icon when it comes to performance carburetors. From their roots as the premier carburetor on many factory muscle cars to powering thousands of vehicles across the finish line, the Double Pumper is a great choice whether you are burning up the street or the quarter mile. 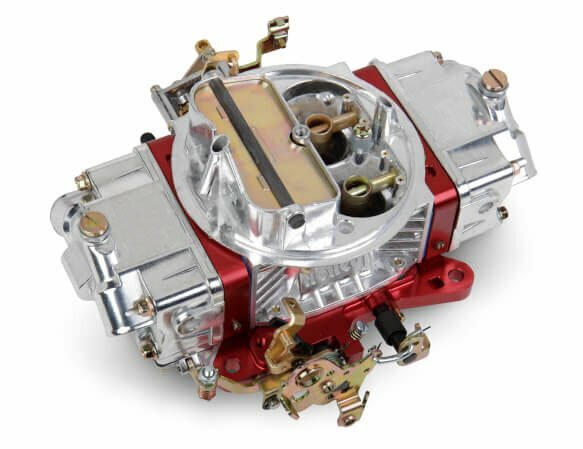 The Ultra Double Pumper™ Carburetors feature all aluminum construction and are equipped with metering blocks and a base plate made from 6061–T6 billet aluminum. They weigh in at approximately 5 lbs. less than a comparable zinc carburetor. The new Ultra Double Pumper Carburetors have an enhanced fuel curve for optimum performance, with many more features such as aluminum construction; anodized billet aluminum metering blocks and base plate; 4 corner idle for precise idle control; dual accelerator pumps for additional fuel under initial acceleration; mechanical secondaries for great performance; clear fuel level sight plugs for easy, no mess fuel level adjustments; Ford automatic transmission kickdown for use on popular Ford transmissions; four vacuum ports for all necessary vacuum accessories; and manual choke for easy, fast cold start–ups. The clean, polished look coupled with Red metering blocks and throttle body will certainly set your ride apart whether you are at the show or track.